In case you don’t know how I feel about rearranging, I loooove it. The urge struck again last night. We have very limited space in our main room for furniture, “office” stuff, music stuff and all of the boys’ paraphernalia. For Little Man, I attempt to keep his toys/books to a little bookshelf next to the couch (it was actually my bookshelf when I was little. Thanks Mom!). I would’ve included real pictures, but as you may recall, we’re in between cameras right now. So, enjoy the old-school images – waterproof marker style. It worked fairly well, except for one small detail. There was a little gap in between the wall and the bookshelf where Little Man would spend hours shoving all his books and/or toys into. Shove, shove, shove. See the gap? Tons of room to shove things. Now, I had mixed feelings about this space. One the one hand, it kept him occupied for gloriously long periods of time. On the other hand, I didn’t like all the books being stuffed into this little space, and it was a hassle to clean up. More so than the usual cleaning-up. It was like this for months. He would stuff, I would de-stuff. And so on. Then, last night, I had an epiphany! 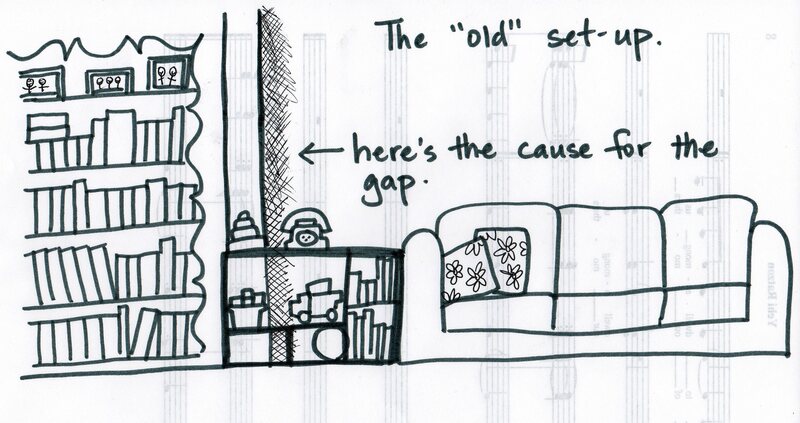 If I merely moved the bookshelf so it was parallel to the couch rather than perpendicular, it would eliminate the gap. Sweet! 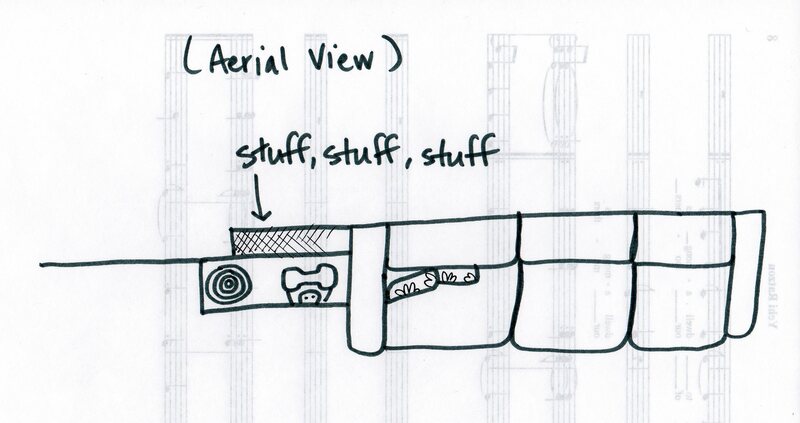 Totally excited about this solution. Don’t make fun. I’m telling you, if you think on it long enough, there is always a way to improve the flow of your rooms. And rearranging is almost as good as buying new furniture. For me, at least. Previous Post OMG I’m on KOAB! Next Post What’s Your Take Results: How often do you “date” your spouse? Congratulations on rearranging. And I Love the drawings–very cute! 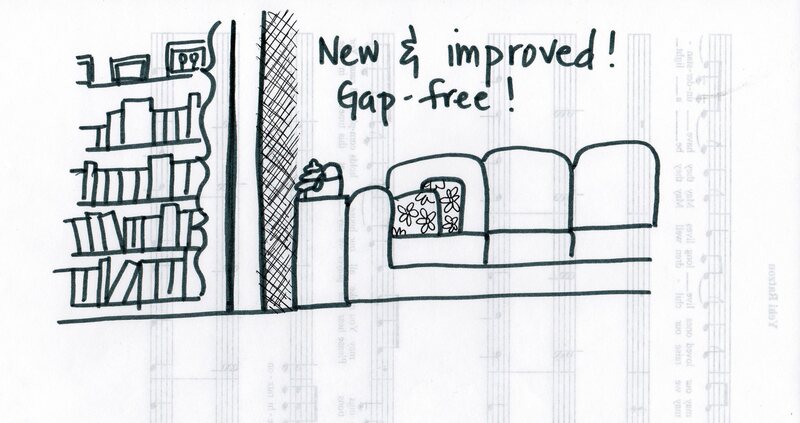 Thanks – it was fun (both the rearranging AND the drawing!). Thank you. :) I think I may have to do it more often. You drew that really nicely! And congrats on rearranging it all! I’m glad you found a solution. I just hope LM cooperates and finds another way to keep himself busy – maybe by actually playing with his toys!